This January, Ecole Chocolat celebrates it’s 14th anniversary! Have you ever wondered how Ecole Chocolat came to be? Our Founder and Lead Instructor Pam Williams shares the story of her career in the fine chocolate industry and what inspired her to start a chocolate school! It’s hard to believe that I have been involved in the world of chocolate for over 35 years. Growing up, my family all loved chocolate, but it wasn’t necessarily an obsession. I found out I loved to cook in high school the moment I baked my first chocolate cake, and went on to become a “foodie” in my adult life. I was a Julia Child rather than an Audrey Hepburn groupie. But that being said, I never planned on being in the culinary industry. Food was always my hobby, not my vocation. That all changed in the spring of 1981 after I moved from California to Vancouver, B.C. and I was looking to start a new business. I saw an article in (the now defunct) Gourmet Magazine on the founding of Li Lac Chocolates in New York and a light bulb went off. Six months later we opened au Chocolat focused on selling the best chocolate products I could “curate”, including truffles we made in house. My storefront in Vancouver, B.C. I took on the role of chocolatier and learned about fine chocolate making on my own. Lots of experimentation with huge successes (B52 truffle) and failures (house made gelato before anyone knew what ‘gelato’ was). And of course, lots of laughter and crazy times! Our first holiday season we worked through the night making products only to sell out by noon and have to start all over again! Don’t get me wrong – selling out is not a bad thing. But, as with many lessons I learned about the business along the way, it quickly made me realize that I really needed to get my recipe development and production streamlined – like buy a tempering machine, duh! We wrote a cookbook in 1985 called Oh Truffles which was a collection of the truffle recipes we used at au Chocolat. It went on to become a Canadian bestselling book which introduced us to people across Canada. You can still find a few copies hanging around on Amazon. It was so much fun doing the cookbook and corresponding with consumers after it was published. In 1992, I sold the business to a friend of a friend and moved on to teaching new venture startup and writing. That period included a contract with the Vancouver Museum to revamp their retail operation. Along the way I discovered something called the Internet and fell madly in love the possibilities for its future. So much so, that I took myself off to school to become (what was called at that time) a multimedia specialist. That led me to a position at the University of British Columbia where I developed award-winning online educational platforms and programs for their Department of Continuing Studies. During this time, chocolate was always my life as I continued to write articles and kept up to date with my colleagues from the chocolate world. Because of my writing, I was always getting requests from readers about where they could learn to be a chocolatier. There were only two places that taught chocolate work, and primarily to technicians from big confectionery companies. Neither of these had curriculum that would be helpful to someone wanting to start their own business or simply wanting to become more expert in fine chocolate work. In 2003 Ecole Chocolat was born, starting with the Professional Chocolatier program. Over the course of the first 5 years, the school slowly, completely took over my life. I was able to combine my experience with chocolate techniques and running a business with my experience developing online education programs to create an online learning platform that allowed students to take the program from anywhere in the world. My goal in starting Ecole Chocolat was (and still is) to teach our students everything that they need to know about understanding and working with fine chocolate, as well as opening a chocolate business if they so desire. That includes not only modern chocolate techniques and production, but all the other efficiencies and knowledge that make up a chocolate business. There are so many details in running this type of business that people may not think about. For example: as a chocolatier or chocolate maker you will be standing for hours on end, especially when you are successful – is that something you’re comfortable with? Or when you’re choosing space for your business, factor in lots and lots of storage space for your packaging! I learned a lot over the 10+ years that I owned my business, and I wanted to share all that knowledge with my students! We also set out to make a difference in the fine chocolate industry itself (the very small 3% segment of the huge chocolate confection industry) by creating the Fine Chocolate Industry Association in 2007. The FCIA’s goal was, and still is, to provide educational and networking opportunities to its members. I have been privileged to be the past President of the Association that is growing and flourishing under the current President, Board of Directors and Executive Director. And then in 2012, I was one of the founding members of the Heirloom Cacao Preservation Fund which went on to become a 501c3 non-profit focused on the global pressures of environmental change, deforestation, and economic influences threatening the world’s supply of high quality, flavorful cacao. And even more importantly, on improving the lives of the farmers who help us to protect and preserve cacao diversity and the chocolate they produce. We know that we are making a difference one farmer at a time by making sure that their fine flavor cacao is recognized for its quality and that they are rewarded economically. 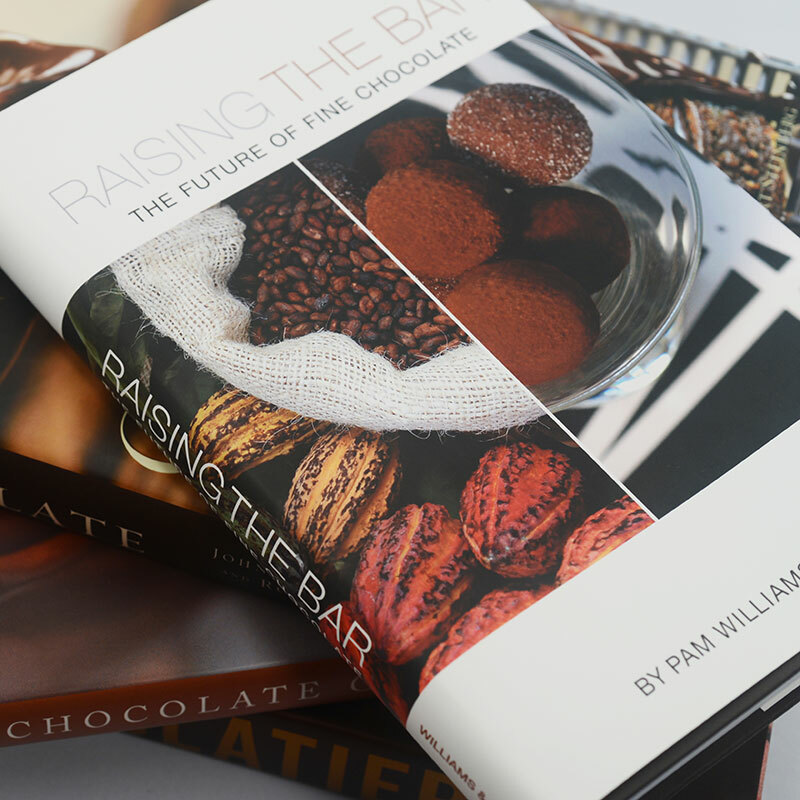 Also in 2012 we wrote our second book: Raising the Bar – The Future of Fine Chocolate. Since it deals with the future, we already have done a second edition and plan to revisit our stories and predictions with a new edition every few years. Along this Ecole Chocolat journey over the past 14 years, we have met so many wonderful students and new colleagues in the chocolate industry. My life has been enriched beyond measure by the people that I’ve gotten to know. I am lucky that I spend my days talking with our students, answering questions from consumers, and making the curriculum for our programs the best that it can be by keeping up to date on the ever changing chocolate world. I hope that we make a difference in our student’s lives by giving them the tools they need to be as successful as possible. I am so glad that I opened that copy of Gourmet Magazine many moons ago and started this chocolate journey! I’m excited to see what the future holds for our school and the fine chocolate industry and look forward to continuing to make a contribution to this industry that I am so passionate about. Dear Pam, I was privileged to have been in one of your graduating classes of Ecole Chocolat in 2006. I just want to thank you for offering your online classes for those of us who love, and wanted to learn to work with, chocolate! Yours is truly a labor of love!! Dear Sue, Thank you so much for your comment! I feel so privileged to have worked with so many passionate and dedicated students like you over the years!